Even a small house fire can cause widespread damage from flames, heat, and smoke. Major fires could result in total property loss, injuries, or fatalities. Take fire prevention steps to reduce your risk. Careful smoke detector placement will maximize the benefit of each unit. You should have a smoke detector in every bedroom and on every floor of your home. To determine the best areas for smoke detector placement, consider where fires are likely to start. Detectors should be positioned to pick up the presence of smoke as early as possible. Because of sleep and relaxation, you tend to be less alert in your bedroom. Bedroom doors are often kept closed, preventing smoke from flowing into or out of a room easily. The best smoke detector placement is to install a unit in each bedroom and another unit in the hallway outside the bedroom. Home fires are often caused by cooking, so smoke detector placement near the kitchen is essential. However, smoke detectors can also pick up normal levels of smoke from cooking. Install a detector 10 feet away from your stove or oven to reduce false alarms. Clothes dryers can cause fires because of the heat combined with clothing and lint, which are flammable. The dryer is often left unattended so you may be unaware of smoke in the area. Install a smoke detector in your laundry room to alert you in case of a dryer fire. 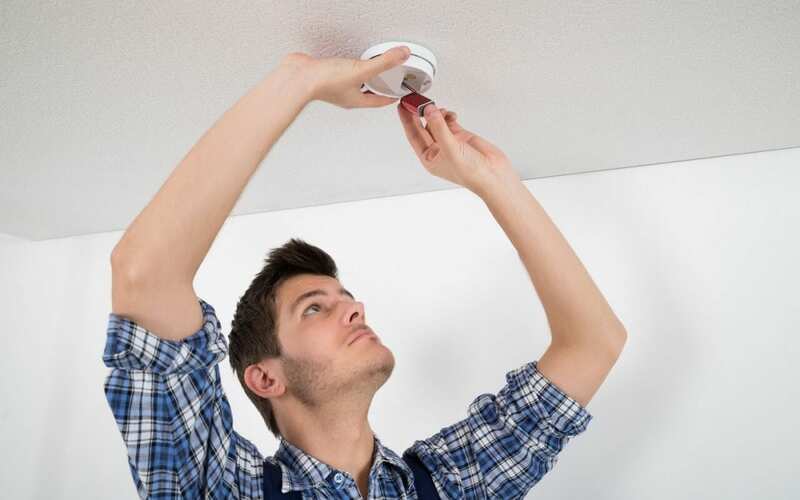 The best smoke detector placement is on the ceiling or high on the walls. Smoke rises and accumulates overhead before it fills lower spaces in the room. For early detection, place your units where the smoke goes first. Smoke detectors are essential for your home fire safety plan. Make sure the smoke detectors work by testing them monthly and replacing the batteries every year or as needed. Mark your calendar or create a smartphone reminder to complete these tasks on time. Homebuyer’s Inspection Service provides home inspections to the Dallas-Fort Worth area. Contact us to request an appointment.